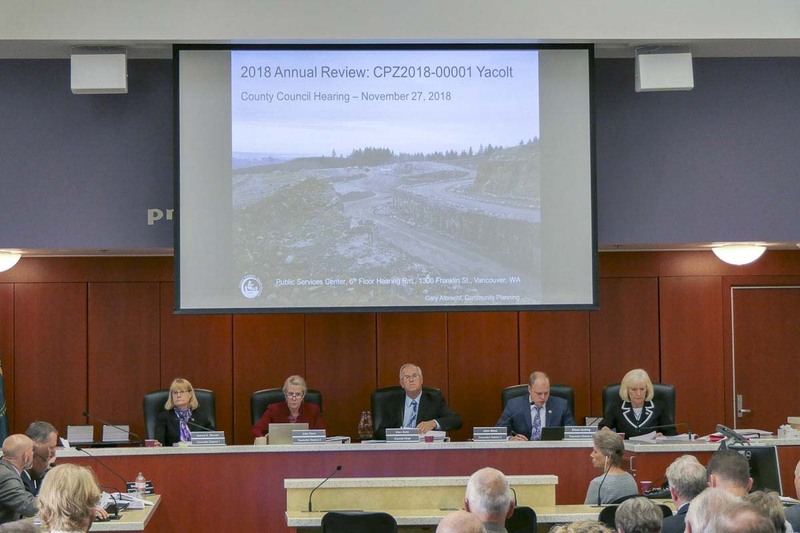 CLARK COUNTY — The Clark County Council on Tuesday decided to push back a decision on expanding a mining overlay at the Yacolt Mountain Quarry. After hearing hours of public testimony, the council members decided to give Deputy Prosecuting Attorney Christine Cook a couple of weeks to work with mine operator J.L. Storedahl & Sons, crafting an agreement that would ensure the expanded area, to the south of the existing rock quarry, would not be used for mining anytime soon. Indeed nearly two dozen people, most of whom live within a couple miles of the quarry, spoke out in opposition. Most told stories of loud explosions rocking their homes, equipment noise even during early mornings and weekends, and massive double-trailer dump trucks barreling down the narrow roads above Lucia Falls, creating a traffic hazard on the steep rural streets. Ogier says they took a sample of the dust and had analysis done, which showed that it may be mordenite, a known carcinogen linked to mesothelioma. Storedahl said they have equipment designed to keep dust from blowing out of the mining operations, including fog machines that wet down rock as it’s being crushed. “I’ve defended myself in court on those accusations and they were found to be unsubstantiated,” said Storedahl. “I would welcome someone to come up and test for carcinogens … I’m willing to prove that we’re not doing that. Other neighbors said they’ve seen sections of the East Fork of the Lewis River in the area, as well as a number of holding ponds, filling up with silt during mining operations, raising concern that dust is being washed into the river. 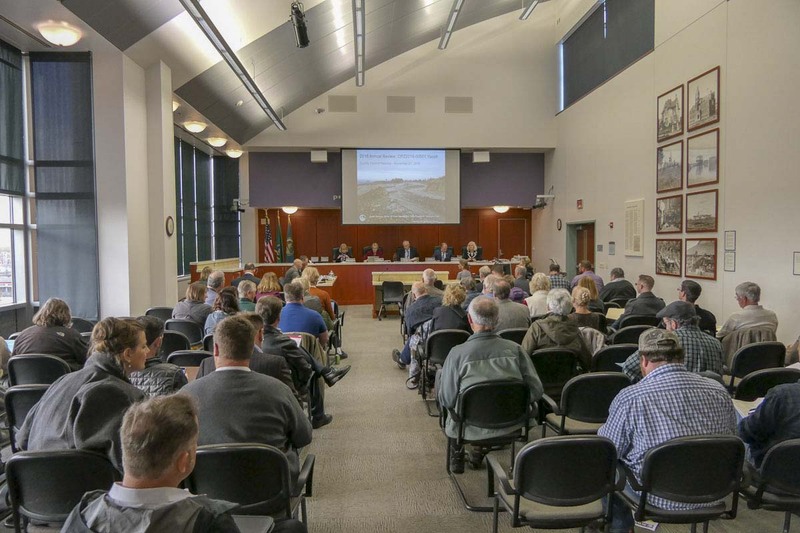 Most who spoke in favor of expanding the mining overlay argued that most other area quarries are tapped out, or close to it, and that the Growth Management Act requires that the county identify and take advantage of resources to support local growth. The company bought 107 acres of former timber land south of their operation in 2016. Storedahl officials say they did it to prevent anyone else from coming in and trying to develop housing on the land, so near the existing mine. The overlay, he says, would allow them to store excess dirt from the mining operations, with the hopes of creating a sound buffer. “We have zero intention of continuing expansion on that property. None,” said Storedahl, while admitting that he wouldn’t rule out seeking to mine the property when the existing mine has been tapped out. This is the second time Storedahl has sought to expand their mining overlay in the area. A previous request was denied in 2014 by a unanimous vote of the three member Clark County Commission. Storedahl pointed out that his operation is already overseen by at least half a dozen regulatory agencies, including frequent inspections, and that any attempt to expand into new mining operations on the additional 107 acres would need to clear a number of hurdles. County staff recently recommended that the overlay expansion should be approved, but the Community Planning Committee voted 5-2 against expansion, arguing that they felt Storedahl had failed to make a compelling case for approval. 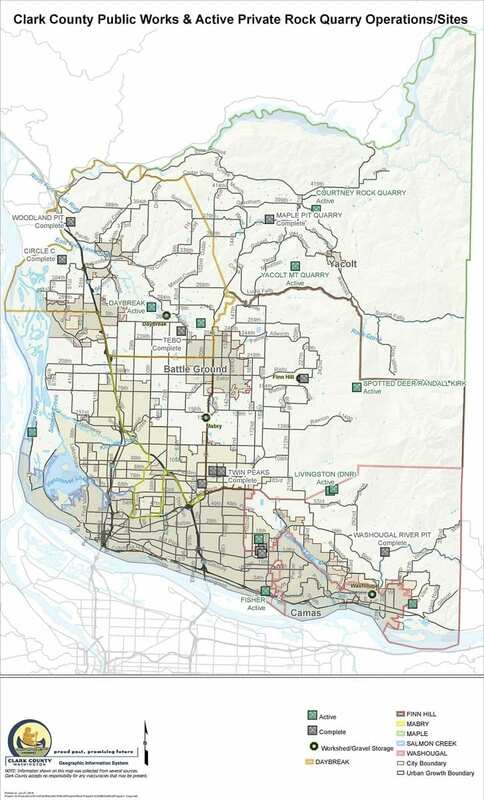 Outgoing Council Chair Marc Boldt said he understood the concerns of people who live in the area, but also that he felt people were reading more into the expansion than needed to be. Despite that, the other councilors, minus John Blom who had to leave during the hearing, said more caution needed to be taken this time. Councilors Eileen Quiring and Jeanne Stewart agreed, while noting that the council does have a duty to ensure that local construction isn’t impeded by a lack of resources. “To me this is a really hard decision, because we need rock,” said Quiring. Community Planning Director Mitch Nickolds agreed that, while things have improved, oversight of the local quarries has been lax at the county level. He indicated his department would like to work with citizens in those areas, along with Storedahl, to try and better understand the problems and how to address them. The councilors instructed Deputy Prosecuting Attorney Cook to work with Storedahl in the next couple of weeks to draft an agreement that would prevent any expansion of mining operations for a certain period of time, and address concerns with truck traffic in the area. Council will hold another public hearing on the matter on Dec. 11.